Set up in 1819 when the Nottingham Monthly meeting and its components were transferred from Philadelphia Yearly to Baltimore Yearly. At the time of the Separation, the majority of the group was Hicksite. The Hicksite branch had the following component meetings in the latter part of the 1800's: Nottingham Monthly, Little Britain Monthly and Deer Creek Monthly. 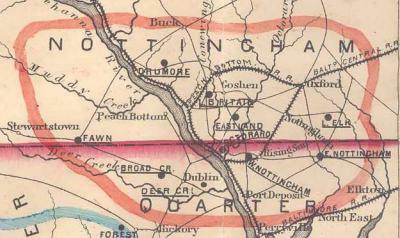 The attached image shows the map of the Nottingham Quarter in 1850, provided in Levi Brown's book documenting the early Quaker meetings.